I've uploaded two Solo Flute Videos from my recent faculty recital at Longy School of Music in Cambridge, MA. These are two beautiful slow, lyrical pieces by Bach and Piazzolla, Enjoy! I will be uploading more videos next week when I get the footage of the recital from the School's Recording office. Thanks for watching. 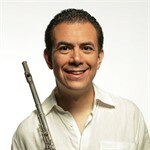 Become a fan of Marco Granados to hear about new music, videos, event info & special offers.